Overtime Rates Depend on Job Duties, not Position Title | Kalijarvi, Chuzi, Newman & Fitch, P.C. The Federal Government Misclassified Bureau of Prisons Teachers as FLSA-Exempt. Normally, teachers and other professionals such as attorneys, doctors, and engineers employed by the federal government are considered to be FLSA-exempt “learned professionals” under 5 C.F.R. § 551.208. If these employees are properly exempt from the requirements of the FLSA, the government can cap their overtime rate at the GS-10 step 1 rate instead of paying full time and one-half overtime based on their actual salary. At FCC Coleman, the teachers did not spend the majority of their time performing duties associated with teaching, which are considered exempt. Rather, because the Bureau of Prisons required teachers to perform numerous correctional officer duties, they were only able to spend a few hours a week in the classroom. Instead of teaching the inmates themselves, the teachers were forced to rely on inmate tutors while they monitored inmate movements, searched facilities for contraband, responded to emergencies, participated in “fog watch” patrols, tracked down missing inmates, and performed a variety of other correctional officer duties. The teachers’ union filed a grievance, and the arbitrator agreed that the Bureau of Prisons had misclassified the teachers as exempt from the FLSA’s overtime requirements. As a result, the teachers are entitled to (1) time and one-half overtime going forward based on each of their salaries; (2) backpay for the difference between the value of what the government paid the employees and what they should have been paid; and (3) liquidated damages equal to the full value of the backpay. Misclassifying Employees Can Be an Expensive Mistake. Employees fall into two basic categories under the FLSA: “non-exempt employees” (i.e., employees who are covered by the FLSA’s protections; and “exempt employees” who fall within one of the FLSA’s narrow exemptions and thus are not protected by the Act. Congress structured the FLSA to broadly protect employees, and the FLSA establishes a presumption of nonexempt status that an employer may overcome only by proving each element of a claimed exemption. See Astor v. U.S., 79 Fed. Cl. 303, 308 (Nov. 13, 2007) (citing 5 C.F.R. § 551.202(b)). In short, if an employer, including the federal government, classifies its employees as FLSA-exempt, it has the burden of proving that the classification is proper. 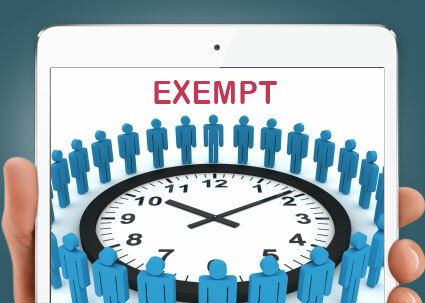 Clearly, employers have a financial incentive to classify employees as FLSA-exempt: when properly exempted from the FLSA, employees are not entitled to “time and a half” overtime pay, which can represent a significant expense for an organization. As a result, although the employer’s burden of proof is high, some employers still find the economic benefits of improperly labeling employees “FLSA exempt” too tempting to resist. However, employers are short-sighted if they classify employees as FLSA-exempt without engaging in a full evaluation of the duties they perform and whether they truly meet each element of a proper FLSA exemption. The FLSA includes stiff penalties for employers who misclassify their workers. Where the employer cannot meet the significant burden of showing it properly classified its workers, employees may be entitled to back pay for the difference between the rate they were paid and time-and-a-half overtime, plus an equal amount in liquidated damages, plus the attorneys’ fees necessary to enforce their rights under the FLSA. What might have seemed like a quick way to save money on overtime can easily become an expensive mistake for an employer. Why It Is Important to Question FLSA Determinations. In cases such as FCC Coleman, the employer may point to the position title or description as evidence of the employees’ exempt status. However, job titles and position descriptions do not determine whether an employee is exempt. Rather, for federal employees such as the teachers at FCC Coleman, “The designation of an employee as FLSA exempt or nonexempt ultimately rests on the duties actually performed by the employee.” 5 C.F.R. § 551.202(e) (emphasis added). Any other approach would allow an employer to arbitrarily classify employees and eliminate FLSA protections at will. The decision at FCC Coleman is significant because it shows that even the federal government is not immune from misclassifying its employees as FLSA-exempt. FLSA-exempt employees should consider whether their duties actually match their job titles, and whether they have a claim for higher overtime rates and back pay based on the work they actually have been performing. PreviousWhat’s Leave Got To Do With It? Revisiting Leave as a Reasonable Accommodation under the ADA in Severson v. Heartland Woodcraft.